← Will the Higgs Boson Destroy the Universe??? There’s a LOT of data on that plot, but for lack of time let me cut to the chase. The most important information is on the bottom two charts. The only problem with the Kp index is that it is a 3-hour average, so it may not go red until the auroras have already been going for a couple of hours! So that’s why the row above it, “GOES Hp”, is important and helpful. This plot gives you much more up-to-date information about what the magnetic field of the earth is up to. Notice, in the plot above, that the magnetic field goes crazy (i.e. the lines get all wiggly) just around the time that the Kp index starts to be yellow or starts to be red. Therefore, keep an eye on the GOES Hp chart. If you see it start to go crazy sometime in the next 48 hours, that’s a strong indication that the blast of electrically-charged particles from the Sun, thrown out in that recent solar flare, has arrived at the Earth, and auroras are potentially imminent. It won’t tell you how strong they are though. Still, this is your signal, if skies near you are dark and sufficiently clear, to go out and look for auroras. If you don’t see them, try again later; they’re changeable. If you don’t see them over the coming hour or so, keep an eye on the Kp index chart. If you’re in the mid-to-northern part of the U.S. and you see that index jump higher than 5, there’s a significant geomagnetic storm going on, so keep trying. And if you see it reach 8 or so, definitely try even if you’re living quite far south. Of course, don’t forget Twitter and other real-time feeds. These can tell you whether and where people are seeing auroras. Keeping an eye on Twitter and hashtags like #aurora, #auroras, #northernlights is probably a good idea. One more thing before getting into the science. We call these things the “northern lights” in the northern hemisphere, but clearly, since they can be seen in different places, they’re not always or necessarily north of any particular place. Looking north is a good idea — most of us who can see these things tonight or tomorrow night will probably be south of them — but the auroras can be overhead or even south of you. So don’t immediately give up if your northern sky is blocked by clouds or trees. Look around the sky. Now, what are you seeing if you are lucky enough to see an aurora? Most likely what you’ll see is green, though red, blue and purple are common (and sometimes combinations which give other colors, but these are the basic ones.) Why? A sunspot — an area of intense magnetic activity on the Sun, where the sun’s apparent surface looks dark — becomes unstable and suffers an explosion of sorts, a solar flare. These charged particles travel at high speeds (much faster than any current human spaceship, but much slower than the speed of light) across space. If the sunspot that flared happens to be facing Earth, then some of those particles will arrive at Earth after as little as a day and as much as three days. Powerful flares typically make faster particles which therefore arrive sooner. When these high-energy particles (electrons and ions) rain down onto the Earth, they typically will hit atoms in the Earth’s upper atmosphere, 40 to 200 miles up. The ensuing collisions kick electrons in the struck atoms into “orbits” that they don’t normally occupy, as though they were suddenly moved from an inner superhighway ring road around a city to an outer ring road highway. We call these outer orbits “excited orbits”, and an atom of this type an “excited atom”. Eventually the electrons fall from these “excited orbits” back down to their usual orbits. This is often referred to as a “quantum transition” or, colloquially, a “quantum jump”, as the electron is never really found between the starting outer orbit and the final inner one; it almost instantaneously transfers from one to the other. In doing so, the jumping electron will emit a particle of electromagnetic radiation, called a “photon”. The energy of that photon, thanks to the wonderful properties of quantum mechanics, is always the same for any particular quantum transition. Visible light is a form of electromagnetic radiation, and photons of visible light are, by definition, ones that our eyes can see. The reason we can see auroras is that for particular quantum transitions of oxygen and nitrogen, the photons emitted are indeed those of visible light. Moreover, because the energy for each photon from a given transition is always the same, the color of the light that our eyes see, for that particular transition, is always the same. There is a transition in oxygen that always gives green light; that’s why auroras are often green. There is a more fragile transition that always gives red light; powerful auroras, which can excite oxygen atoms even higher in the atmosphere, where they are more diffuse and less likely to hit something before they emit light, can give red auroras. Similarly, nitrogen molecules have a transition that can give blue light. (Other transitions give light that our eyes can’t see.) Combinations of these can give yellows, pinks, purples, whites, etc. But the basic colors are typically green and red, occasionally blue, etc. 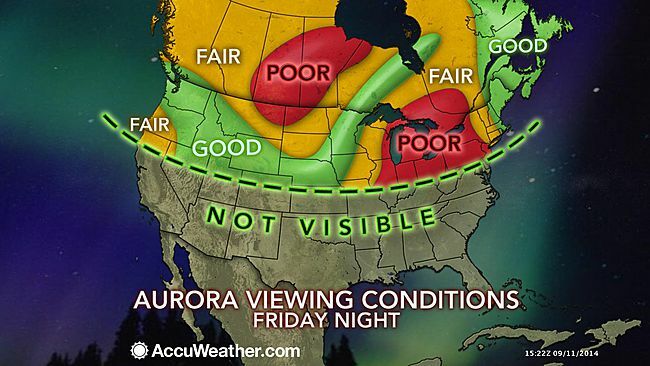 So if you are lucky enough to see an aurora tonight or tomorrow night, consider what you are seeing. Huge energies involving magnetic fields on the Sun have blown particles — the same particles that are of particular significance to this website — into space. Particle physics and atomic physics at the top of the atmosphere lead to the emission of light many miles above the Earth. And the remarkable surprises of quantum mechanics make that light not a bland grey, with all possible colors blended crudely together, but instead a magical display of specific and gorgeous hues, reminding us that the world is far more subtle than our daily lives would lead us to believe. This entry was posted in Astronomy, Particle Physics and tagged astronomy, atoms, auroras, press. Bookmark the permalink. Thanks for sharing that enlightening information on auroras! I remember coming home from my girlfriends a long time ago, looking in the rear view mirror and seeing the northern lights dancing in the northern sky. It was an awesome sight. Hopefully I am luckky. Btw, I just read that in 2010 measurement results of american and european cluster satellites were published in 2010 in Glasgow with regard to the acceleration of electrons and ions providing possible new insight as to the originating of auroras. What an eloquent description. Unfortunately I don’t hold out much hope of seeing an aurora in Austin. Thanks for the awesome post, Professor Matt Strassler. I had a question and one request. First the question: I read about stimulated emission somewhere. Is quantum transition whereby a release of photon when the electron transitions from a higher energy level to a lower energy level the same as stimulated emission? Cause in stimulated emission as Wikipedia says, there is a photon exciting the atom to a higher energy state; here that work is being done by charged particles from the sun being accelerated by the magnetic field of the earth. And for the request part, I would be very much thankful if you would recommend me undergraduate/graduate level books for Physics. Being an MD, I left Physics after A levels. But it just strikes me so much. I want to self study it. It excites me more than medicine does. So I wanted to self study Physics properly. Having a sound background in Calculus and with MIT courseware available, I can hone Mathematical skills and all but I just need a starting point. So needed suggestions for books of classical mechanics, electrodynamics, quantum mechanics, field theory/special relativity, GR, particle physics and stat mech? Is Griffiths good for the main subjects? Having discovered your site just recently,will surely dig more into it. Thank you. You are doing an awesome job. I can take a block of ruby and ‘pump’ energy into it boosting some of its electrons into higher energy orbits. If I leave that block it will slowly spontaneously decay in all directions over time, like an aurora. I can however ‘force’ or stimulate it to decay much more quickly and in a much more organized manner. Okay thanks Kudzu. Got it. So stimulated emission results in ‘clones’ and more concentrated beams of radiation. Just got why lasers stand for light amplification by stimulated emission of radiation. Thanks a lot. @alisyedraza. Let me add little bit to Kudzu’s answer. Laser action requires higher density of atoms and certain condition of metastability,i.e the electrons have to hang in the excited levels for considerably longer time than the usual quantum jump time. Then, in the stimulated emission, large number of atoms (electrons) make simultaneous transitions .Then the light coming out would be very intense, unlike ordinary light emission. Such conditions would be unlikely to be present in our atmosphere. But I would not mind being disproved! Congratulations for taking time out of your medical work to study physics. Just opened the resource page; looks awesome. Thanks a lot. And about the school, might be looking for some school offering evening undergrad classes. Yes, that’s a great page by t’Hooft. One remark from my experience of studying physics for some time in university and outside: A dangerous trap to fall into when you learn on your own is to learn too passively, i.e. mostly by reading. As a student at a school/university you are forced to work actively in tutorials, exams, labs, etc. This is one of the many good reasons for going to a school. When you learn on your own, be sure to do the exercises in text books and try to do small projects for working out stuff actively. I think a good rule of thumb is to spend more time working through stuff with the book closed than you spend time reading or watching lectures. This is extremely important because just by reading you will not gain a real understanding of the theories and after a while you are likely to stagnate. I saw Aurora once in Svalbard, the very Northern group of islands of Norway in October of 1984. It was the way you described it: very changing in colors, fragile, disappearing and then appearing and reappearing in different parts of the sky. May I ask you a Q ? When you said that electrons “jump” from a more exited quantum level(s) to less exited one(s) “almost instantaneously”, does it mean that they do it with a speed of light, or you used it as a figure of speech ? We will be thankful for your down to earth explanations of complicated natural science Professor. The energy of that photon, thanks to the wonderful properties of quantum mechanics, is always the same for any particular quantum transition – If, the energy needed to create virtual particles, “borrowed” from the vacuum for a period of time, cancel each other out, *not* breaking any of the laws of classical physics ? Please explain the virtue of quantum tunnelling and Heisenberg’s uncertainty principle in nuclear fusion of Sun. If an electron gets too close to the nucleus, its location in space would be very precisely known, and its velocity would therefore be very uncertain and it could acquire enormous speed, enough to ensure that it did not stay confined in the nucleus. Is there any INVOLUTION involved between highest energy level and lowest energy level ? Virtual particles do not really ‘borrow’ energy then ‘pay it back’; that suggests that the universe is an empty space with virtual particles ‘popping’ in and out of existence like bubbles.In reality virtual particles are just wiggles in various fields. If you look closely at the vacuum it is a mess of wiggles which mean its energy is not in fact zero. It has some ‘spare’ for doing neat things. In the sun, if protons obeyed classical physics, they would need to get very, very close to fuse into helium. The sun would need to be much bigger to do this. However since there is some ‘wriggle room’ in the position of protons and two protons can ‘tunnel together’ if they are close enough, what happens is that protons only need to be quite close to fuse. Uncertainty and tunneling means that the sun is always going ‘Eh, that’s close enough’ when fusing. The lowest energy level of an atom is the exact balancing point where the energy an electron loses by being close to protons is offset by the energy gained because of its position being better known. You can in fact use the mass of the electron and the uncertainty equation to calculate the size of a hydrogen atom. I second bob-2’s question; are ‘quantum leaps’ instantaneous, light speed or just quite fast? Could I ever, even in theory, ‘catch’ and electron between orbits? I am afraid that instantaneous quantunm ” leaps” are inconsistent with Planck’s quantum hypothesis and with Heisenberg’s uncertainty principle. @Bob-2 and Kudzu. Perhaps I should let Matt answer this. But here is my answer. Each quantum transition takes a definite time.If you catch electron between the orbits, you would be violating fundamental postulates of quantum theory. So it should not happen even in theory! The postulate is that there is nothing in between! The concept of in between state is classical. That would be a breakdown of quantum theory! IMHO, No Quantum determinism. there is zero between negative and positive numbers, if you split the zero and join the two extreams of + ve and – ve — it is “ivolution”. Information is lost inbetween – non function of mathematics and mass energy. No difference between highest and lowest energy level ? So no time limit evolution. New physics at non-mass-energy level ? The whole idea of quantized energy levels would be at stake if there could be any ‘catching’ of electron between orbits. Discrete energy levels existing because it is quantum in nature. no? Indeed but the thing is, I’m not sure that’s what I’m saying. Around an atom there are stable energy levels; moving between those energy levels must, due to uncertainty have well… uncertainty around the time the electron ‘jumps’, especially if I want to specify the energies involved precisely. I am wondering then what the electron wavefunction is doing. Does it instantaneously swap between two states or is there some sort of collapse or reorganization as it moves between these two states. The professor’s comment hints at something that interests me. An important point: Quantum mechanics does not claim that the orbits – i.e. states of well-defined energy if we neglect other quantum numbers for simplicity – are the only possible states of the electron! The claim is that they are the only possible stationary states of the electron, i.e. those states that do not change over time, and therefore have well-defined energies. (I will neglect unbound states in this comment.) These stationary states form a basis of the space of all possible states, which means that any state of the electron at a given time can be written as a superposition of stationary states, i.e. of orbits. Thus as soon as you consider processes which change the state of the electron over time, the orbits do no longer give you the full picture, you need all the states that can be built as superpositions of the orbits. These superpositions supply the “intermediate” states which an electron can “go through” during the change from one orbit to another. Please note that this does not mean that the electron will have intermediate energies in between. The energy of the electron is in fact not well-defined during the transition. The total energy can still be well-defined (and constant) throughout the process, but for the full picture you also need to include the electromagnetic field and you need to treat both the electron and the electromagentic field quantum mechanically. If you speak about “catching the electron between orbits”, you need to specify precisely what you mean by that, what you actually want to measure. The general answer from quantum mechanics is: When you measure an observable A, the possible outcomes are the eigenvalues of the operator corresponding to A. For example if you measure the energy of the bound electron, only certain discrete values are possible (namely the energies of the different orbits), nothing in between. Thankyou. This precisely answers the question that I had in a clear and understandable manner. I considered something akin to what you state but lacked the technical knowledge to be sure I wasn’t just making up an idea I liked. More power to your elbow good sir! @Kudzu and Bob-2 If you imagine the electron not as a particle but as a wave you get the picture. The electron transition is like a change from a high pitched note to a low pitched note. Wave function retains information but not its ripples or mass – due to chaotic correlation inside black hole. So time limit evolution of information (mathematics) after evaporation possible – but without the mass ? Thank you for your awesome blog, Dr. Strassler! Quantum decoherence, Experimentalist’s Arithmetic – the modern Copenhagen interpretation. In involution, below 0°K there may be decrease in entropy. Decoherence provides an explanation for the transition of the system to a mixture of states that seem to correspond to those states observers perceive. Moreover, our observation tells us that this mixture looks like a proper quantum ensemble in a measurement situation, as we observe that measurements lead to the “realization” of precisely one state in the “ensemble”.– wiki. True enough. I just wish all you professor types would realize that it is equally true of all fields (politics, economics, medicine, business etc…) that the MSM reports on. The New York times is garbage from page 1. I insist “involutiion” because it explains “color confirmation” and the mass of proton – which is movement energy of gluons (not momentum) – a chaos of “almost non repeating pattern” – means there may be proton decay – may be trillion.. trillion.. years. ? … Sorry “color Confinement” – because of the absence of separating factor between charges. Not sure I get you; movement energy (kinetic) and momentum are related. Proton decay is a constant process, if it occurs it must be happening right now. The only question is how common it is. Currently I believe ‘virtual black holes’ are popular since proton decay seems to be less common than many earlier theories predicted. You are correct sir, Iam not a guided researcher. I place only simple questions. Momentum is at the absence of external force in movement, is constant. It is proportional to the mass. But massless photons have momentum “c” – but photons have particle nature. Inside Proton, this massless parameter is not valid ? Color Confinement shows, there may not ne anything like mass giving factor for W and Z bosons, higgs for electron or particle nature of photons. So no momentum. Though photons in closed box get mass, there should be a “pattern” of its movement – “non repeating pattern” makes decay – making momentum meaningless ? The error lies in p = mv; it is inaccurate because it neglects relativity. (If it was right then you could move faster than light quite easily.) So momentum works the same way everywhere, but you have to be careful how you calculate it. Momentum can be calculated in several ways. If you are considering something as a moving mass then it is the product of mass and velocity. More accurate you should consider it the product of energy (Both mass energy and kinetic energy among other things.) and velocity. At the absence of Lorentz invariance and relativity, Goldstone massless mode became the longitudinal polarization of a massive spin-1 “photon. So a gauge invariance to become massive, it must violate Lorentz invariance and relativity. around the trough of the wine bottle potential – IS NOT INVARIANT. So Higgs mechanism did not work for short range forces. But it worked for weak force W and Z bosons because of “radioactivity” and flavor change – in which akin to EM in charge separation and comply Lorentz invariance and relativity. At high energy, like in super conductivity they become massive but photon remain massless, due to long range. So inside proton no mass energy and momentum, only kinetic energy – and the parameters of space itself (vacuum). If this “vacuum” (parameter) spent extended time in a long lived configuration other than the system’s state of least energy (Lorentz invariance) – this parameters reach and hold stationary values. While in isolation of Lorentz invariance. Thank you Mr. Kudzu, I typed the above at my workplace interval, sorry if any mistskes. I believe relativity is like involution of separate things, who cannot be separated – union of space and time – rest mass is the product of this union. So in reality, “rest mass and time dilation cannot coexist”. It may be due to inflation rather than length contraction ? The time dilation in general relativity, it the lowest energy level in lorentz transformation (clock slow at lowest energy level) – but due to inflation or uncertanity principle, further lowest energy level will decrease the entropy. thanks a lot for the information you have given on the comets. i think i have seen it and also shown it to my friends in the hostel. it was a light green spray kind of thing. a good display by particles on the stage of nature. sir i am interested in theoretical and particle physics can you kindly suggest me websites to give out my ideas and allow it for the discussion. photographer is a high priority job. Gli sposi sono molto pi rilassati in quanto non si sentono guidati per tutto il giorno da un fotografo in cerca di immagini ed inquadrature impostate.